A great lineup of new records from MyHeritage this month. I'm particularly excited about the updates to the Sweden records and all of the new newspaper collections. Below is the official announcement. We are delighted to announce the addition of over 51 million new historical records to SuperSearch™ since our last update in October! These include updates in two of our popular collections: Sweden Household Examination Books, 1860- 1947, and New York City Marriages collection, 1950 – 2017. Also included are 19 completely new collections — 14 of which are in the US Newspaper Collections. Here’s a look at all records added since the October 2018 update. We have recently added over 17 million new records to the Sweden Household Examination Books from the years 1930- 1947, bringing the collection total to 104,449,108 historical records. If you have ancestors from Sweden, this collection is essential as it serves as the primary source for researching the lives of individuals and families throughout the Parishes of Sweden, from the late 1600s to modern times. Collected until 1991 by the Swedish Lutheran Church, the Sweden Household Examination Books contain information about birth dates, marriages, deaths, where people had moved to or from, etc. To learn more about this remarkable collection, check our original blog post or jump right in and search the Sweden Household Examination Books 1860-1947 collection. This update adds 1,633,136 new historical records to the existing 7,882,294 historical records in this collection. The index now includes over 4 million marriage licenses filed at the New York City Clerk Offices in the five boroughs from 1950-2017. 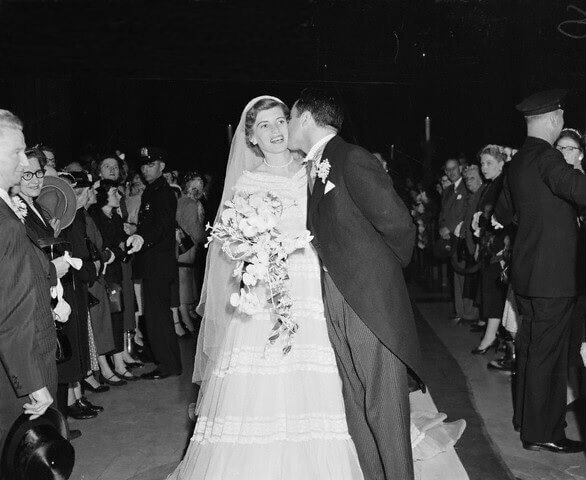 In addition to information on the bride and groom, the New York City Marriages collection contains additional information: Birth dates, birthplaces, occupations; whether single, widowed or divorced at the time of the marriage. It is often possible to learn more information about the bride and groom’s families with parent’s names and birthplaces. Please note that marriage licenses older than 50 years are classified as public documents and available to all researchers. Marriages of less than 50 years ago, however, are restricted and available only under certain circumstances. From this collection is the marriage license of Eunice Kennedy and Robert Sargent Shriver, Jr. It details their marriage license number, location and year in which they were married. Read our original post about our New York City Marriages collection, or search New York City Marriages,1950-2017 collection. The West Virginia Birth Index is a compendium of 3,172,114 records from 1853-1914. Provided by the West Virginia Division of Culture and History, the index includes the name of the infant, birthplace, and names of the parents. Although earlier records show just the year of birth, later records contain the full birth dates. Images associated with the collection offer additional information about the parents such as their ages and birthplaces. See the collection catalog to find all details of the record collection by county. Below is the record of Harley Orrin Staggers (1907-1991). Harley represented West Virginia’s 2nd Congressional District as he served 16 terms in the U.S. House of Representatives from 1949-1981. From the record, see that he was born August 3, 1907 in Cabin Run, Mineral County, West Virginia, to J.K. and Fannie Staggers. Search the West Virginia Birth Index, 1853-1914 collection. The 3,007,161 records in this collection are from the Ohio Department of Health Death Certificates from 1913-1944 and 1954-1963, Stillborn Death Certificates from 1913-1935 and 1942-1953, and Columbus Board of Health Death Certificates from 1904-1908. Death certificates are valuable resources for obtaining the exact name of the deceased, the death date, the death county, and certificate number and can also provide information on the deceased’s life. Drawn from the Ohio Death Index, is the record of Roger Philip Bresnahan, a Hall of Fame Major League Baseball Player who died in Lucas, Ohio on December 4, 1944 at age 65. Search the Ohio Death Index, 1913-1944, 1954-1963. We have added two new US naturalization record indexes: the US Naturalization Record Index, Northern Illinois, 1840-1950 and US Naturalization Records, New England, 1791-1906. The US Naturalization Record Index, Northern Illinois, 1840-1950 is an index of petitions for naturalization filed in Northern Illinois Circuit Court and Immigration and Naturalization Service (INS) District 9 from 1840- 1950. The 1,491,656 records in this collection include – in addition to Illinois – the INS District 9, which covered parts of northwestern Indiana, eastern Iowa, and southern and eastern Wisconsin. From 1840-1906, petitions generally contained the name of the petitioner, the name of the court, record number, the petitioner’s country of origin, and the date of naturalization. From 1906-1950, petitions collected additional information such as the petitioner’s address, names, and addresses of any witnesses, birth date, as well as date and place of arrival in the US. These changes reflect overall changes in how the petitions were collected. Prior to 1906, petitioning for US citizenship could be done through any local, county, state or Federal court. After 1906, the petitions were collected only by the Federal court. The US Naturalization Records, New England, 1791-1906 collection includes 615,903 records. It is an index of naturalization documents filed in courts in the states of Connecticut, Maine, Massachusetts, New Hampshire, Rhode Island, and Vermont from 1791-1906. Below is the naturalization record of John Muir, a Scottish-American immigrant who became a famous environmentalist and author. Known as the “Father of the National Parks”, Muir helped establish Yosemite National Park. 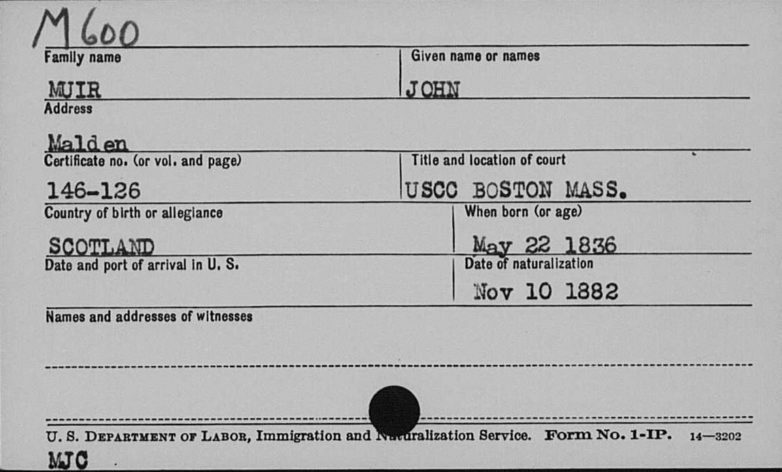 Search US Naturalization Record Index, Northern Illinois, 1840-1950 and New England 1791-1906 or learn more about US naturalization records. In addition to the previous collections, we have added 14 new US newspaper collections reaching a total of 24,376, 578 newspaper historical records. This update contains newspapers from the states of Washington, North Carolina, Alabama, Georgia, California, Missouri, South Carolina, Oregon, Utah, Michigan, Iowa, Virginia, Arizona, and Idaho. 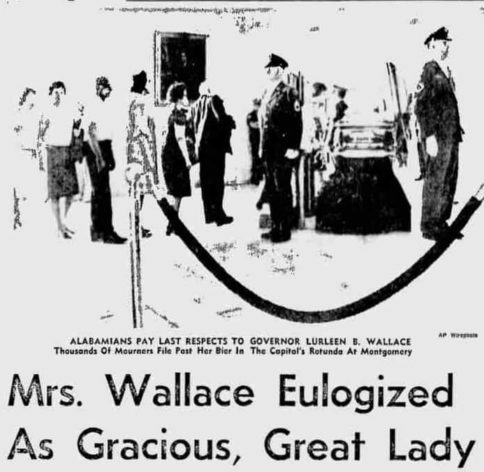 In addition to articles related to important events and activities in the communities, newspaper collections also contain birth, marriage and death announcements, obituaries and society pages. This collection contains both the text and the scanned image of the newspaper article. Search the collection for a particular name or keyword and find a list of articles and an image of with the highlighted name or keyword. After selecting the record, you may enlarge it to full screen to zoom in and read the article from the scan of the original publication. From our new Idaho Newspaper Collections, is an article about Picabo Street in the Sports section of the Moscow- Pullman Daily News, during the 1998 Nagano Olympic Games. On February 11, 1998, Picabo became the first US woman skier to win two gold medals since 1952. Search the 14 new and 37 existing collections in our US Newspaper collections. Searching all these exciting new collections is completely free and accessible through MyHeritage SuperSearch™. A MyHeritage Data subscription is required to view records from these collections, to save them to your family tree or to confirm Record Matches. Enjoy searching these collections and let us know in the comments below what you have discovered!